Please Note: The Vivotek PZ8111W is No Longer Manufactured and has been Discontinued by the manufacturer. The Vivotek PZ8111W Wireless PTZ IP Camera features a 10x optical zoom lens and a 1/4" CCD image sensor. The Vivotek PZ8111W Wireless PTZ IP Camera can support up to 30 frames per second recording in 720 x 480 resolution. This camera is compatible with Wireless 802.11b/g/n. It has a 300° Pan and a 135° Tilt to give the user more control over the environment. The PZ8111W is ideal for securing indoor applications such as business', banks and temperature controlled warehouses. It utilizes the H.264 video compression to reduce file sizes and free up bandwidth. The Vivotek PZ8111W supports two way audio with a built-in microphone and has an audio output to use in conjunction with an external speaker. The PZ8111W is remotely accessible through PC web browsers and 3GPP mobile devices. The Vivotek PZ8111W comes with a 32 channel IP camera software and is also compatible with NUUO IP Camera Software. 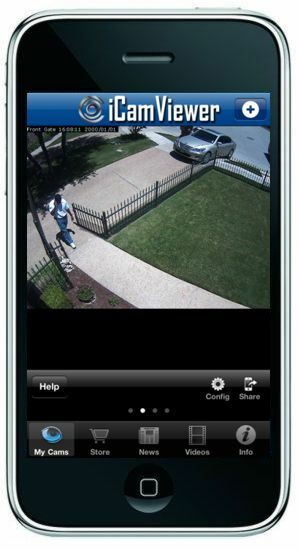 The Vivotek PZ8111W is compatible with the Free iCamViewer app for network cameras.